The picture was taken on a press conference held today, where the major of Reykavík, Dagur B. Eggertsson and the president of Iceland, Guðni Th. Johannesson sat in a classroom alongside other students of Rettarholtsskoli. (photograph: Mbl.is/Árni Sæberg). 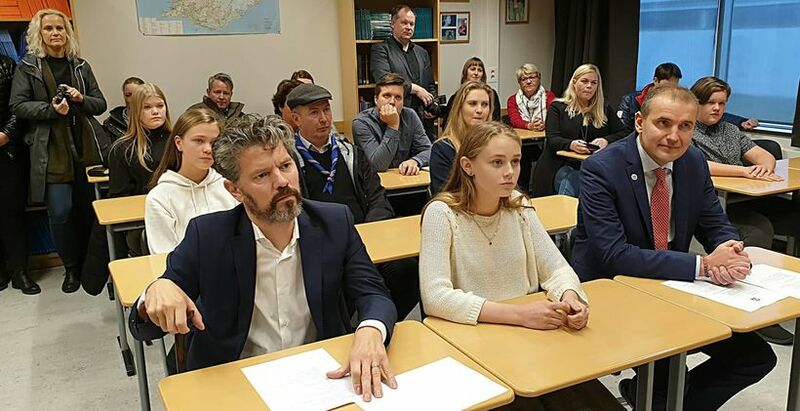 Prevention day 2018 will be celebrated in most elementary schools of Iceland on Wednesday the 3rd of October. That day the mayor of Reykjavik and the President of Iceland discuss the dangers associated with the use of alcohol and drugs. This year a special emphasis will be laid on the growing use of e-cigarettes amongst young people and the misuse of prescription drugs. The prevention day is organized this year by the The Directorate of Health along with ICSRA and other partners, The Icelandic sports and olympic association, The union of Icelandic municipalities and more. The day is celebrated every fall and special focus is laid on the 9th grade of elementary school but the message is also distributed to higher school levels.